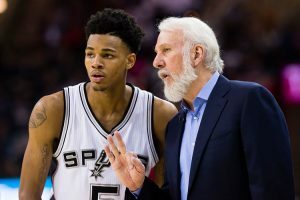 Point guard Dejounte Murray of the San Antonio Spurs suffered a sprained ankle during Wednesday night’s game between the Spurs and Phoenix Suns. Murray sprained his ankle with the Spurs ahead by 27 points during the second quarter at Phoenix. The guard’s left leg buckled while driving to the basket with just over five minutes remaining in the first half. The Spurs starting point guard grabbed his ankle immediately, while veterans Pau Gasol and Manu Ginobili helped Murray to the bench. The second-year point guard was headed toward the team’s locker room, with trainer Will Sevening, but the medical team checked Murray’s ankle near the team’s bench, before he returned to the court to shoot his two free throws. He was then taken out of the game and the team announced he would not return. Murray was recently promoted by head coach Gregg Popovich to the starting lineup permanently, which moved veteran Spurs guard Tony Parker to a reserve role coming off the bench. Before suffering his injury on Wednesday against Phoenix, Murray had scored 14 points in 13 minutes of play hitting 7 of his 12 field goals. He also grabbed four rebounds and handed out three assists. The Spurs defeated the Suns 129-81. Following the game, Popovich said no timetable had been established for Murray’s return. San Antonio, as a club, usually is very cautious with bringing injured players back. A good example of that is star forward Kawhi Leonard who has played only nine of the Spurs’ 56 games thus far this season. At the same time, Rudy Gay continues to nurse right heel bursitis. The team will have time to heal moving forward. After its game on Saturday versus the Golden State Warriors, San Antonio will have time off for the All-Star Game festivities. On Saturday, in a game the Spurs lost to the Utah Jazz, Murray recorded his 500th career point. He became the first player for the Spurs since Leonard to reach 500 points or more as well as 300 or more rebounds during his first 100 games. Murray grabbed 11 rebounds two nights prior when the Spurs played the Rockets, which marked the ninth game in which the Spurs point guard has posted 10 or more rebounds during this season. That gives him the most games with 10 or more rebounds for a Spurs point guard in the same season.